Kitchen Cabinet Depot Blog: CHERRY CABERNET is here! 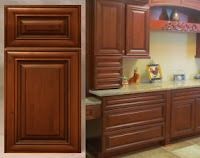 This latest addition to our kitchen cabinets collections has a warm, rich look and lots of great detail. The construction is a step up and is intended for the more advanced handyman. Assembly is still a breeze, but the face frames of the cabinets are actually dovetailed and the cabinet sides slide into the groove to form a super strong, pemenant joint. This means you will need a staple or brad gun to asssemble them. You can purchase an inexpensive brad gun from your local hardware store. Really superb collection of kitchen cabinet.I am thinking for changing the look of my kitchen and now i want to first change my old kitchen cabinet with this new one. It's perfect for my kitchen. National Make A Difference Day Celebration!